The Transformative Power of Processing, Integrating and bringing closure to your birth & postpartum journey. For many women, the experience of childbirth and early motherhood is not what they expected or hoped it be-which often leaves them with unresolved, lingering feelings of disappointment, sadness, overwhelm, fear and/or confusion-all of which affects them as they face future births and their life in general. Learn how process, healing and closure work, specifically focused on your birth(s), can bring a greater sense of peace, freedom and joy to your life. Whether you delivered your baby 10 weeks or 10 years ago, vaginally or by or Cesarean—this healing exploration is available for you. at integralpregnancy@gmail.com or (707) 773-7786. Luma Birth Services with Brooke Radloff and Lisa Flato are happy to announce Birth Choices, a series of events centered on pregnancy, labor, and birth. Each workshop will offer an enriching discussion and demonstration, while offering you professional and personalized guidance for your pregnancy, birth and postpartum journey! Luma Birth Services with Brooke Radloff and Lisa Flato are happy to announce Birth Choices, a series of events centered on pregnancy, labor, and birth. Each evening will offer an enriching discussion and demonstration, while offering you professional and personalized guidance for your pregnancy, birth and postpartum journey. Learn about comfort measures for labor, key elements for an empowered birth experience, navigating hospital protocol, pregnancy & postpartum wellness tips, and much much more! This event will take place the last Wednesday of every month. Come to all or any of the nights. Free for Mama's and Papas-to-be. 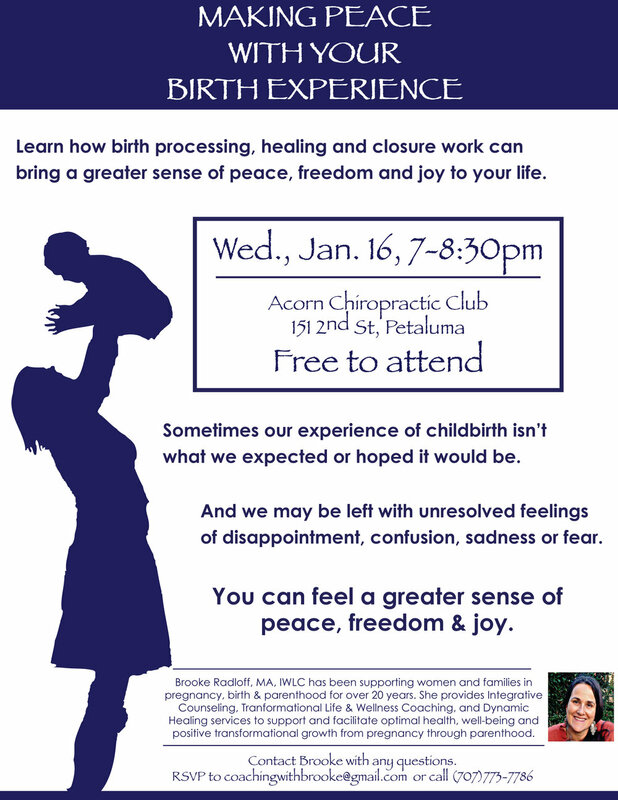 You are invited to join us for a series of discussions and demonstrations on various topics related to birth. Learn about the benefits of working with a birth assistant/doula, comfort measures for labor, hospital protocol, mindfulness practice and much, much more. Integral Health & Medicine Center is a collaborative of health practitioners, educators and policymakers working to steward wholeness, resilience and wellbeing across the human lifespan. We enact an integral healthcare by developing critically thinking, self-reflective and consciously embodied practitioners, prototyping innovative models of care, and collaborating to facilitate the emergence of integral approaches to medical education, practice, and healthcare reform. We are committed to transforming the care experience for patient, providers and institutions by optimizing the salutogenic impact of how we practice for the people and populations we serve. The Integral Model of Pregnancy and Childbirth (IMPC) is a dynamic and interactive blueprint designed to help you systematically approach your entire journey to parenthood from an all-encompassing “big picture” perspective. Brooke has spent nearly two decades passionately studying and working with others in many facets of transformational growth and development. Throughout her adult journey, pregnancy and childbirth support have remained at the core of her heart’s passions, assisting women and their families during labor (at homes and in hospitals), as well as offering support throughout pregnancy and the postpartum adjustment. The Association for Prenatal & Perinatal Psychology and Health (APPPAH) is a public-benefit educational and scientific organization offering information, inspiration, and support to medical professionals, expecting parents and all persons interested in expanding horizons of birth psychology. In this engaging and interactive presentation, Brooke Radloff, M.A. presents her ground breaking Integral Model of Pregnancy and Childbirth (IMPC). Within the framework of her integral model, Radloff demonstrates how pregnant women can work consciously and proactively with the internal and external influences that most deeply impact the quality of her pregnancy and birth experience. Radloff posits that by utilizing the IMPC and integrating somatic, cognitive, interpersonal, spiritual and creative modalities, pregnant women and the practitioners that support them have the potential to systematically and holistically elevate the experience of pregnancy, childbirth, and the transition into early parenthood to a level that can bring about a greater sense of maternal well-being and empowerment while serving as a vehicle for personal growth and psychospiritual transformation. MetaIntegral Foundation will host the 3rd Biennial Integral Theory Conference, the world’s largest academic conference devoted to the field of Integral Theory and practice. The conference will take place in San Francisco, California. Brooke Radloff, M.A. presents her groundbreaking Integral Model of Pregnancy and Childbirth (IMPC) and demonstrates how pregnant women and their partners can work consciously and proactively with the influences that most deeply impact the quality of their pregnancy, birth and postpartum experiences. Radloff posits that by utilizing the IMPC, pregnant women and the practitioners that support them have the potential to elevate the experience of pregnancy, childbirth, and the transition into early parenthood to a level that can bring about a greater sense of well-being and empowerment while simultaneously serving as a vehicle for personal growth and psychospiritual transformation.